One minute you and your dog are climbing through aspen forests or trekking across open space in Douglas County, and the next minute? Your dog steps on a barbed wire, brushes against scrub oak and cuts himself, or accidentally runs into a foreign object (like a stick). Breathe deep. Don’t panic. You can handle this. 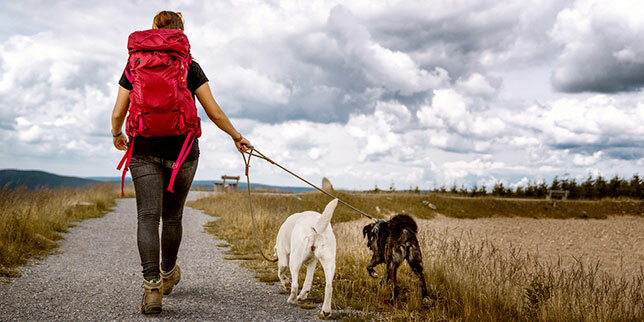 Here are Dr. Melanie’s tips for what to do for a dog wound when hiking. Even if the wound seems minor, call your veterinarian and/or contact an emergency vet near your hiking location as soon as you can. How to improvise: If you don’t have bandage materials, you can use a bandana or a sock. First, flush the wound with water. Don’t try to clean it. Just run water over it to wash it out. 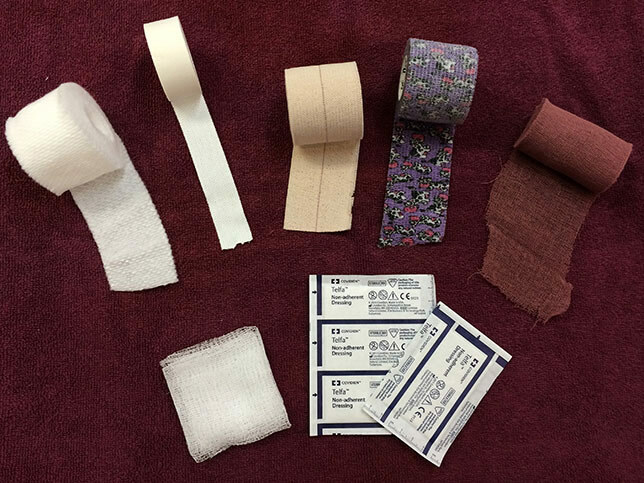 Then, apply a bandage pad to the surface of the wound, wrap it with stretchy bandage wrap (like Co-Flex or an Ace bandage) and secure it with medical tape. There can be a lot of blood. A small wound can bleed intensely because dogs have arteries in their paws. It’s possible your dog may bleed through the bandage. In these cases, if you can carry your dog, that would be best. If you can’t, you’re going to need to keep re-bandaging the wound. Once again, you want to flush the wound with water and apply light pressure to stop the bleeding. With a chest wound or abdomen wound, too much pressure can hurt your dog’s ability to breath. Just lay the bandage on there to cover the wound and loosely apply pressure to stop the bleeding. If you have a Co-Flex or Ace bandage wrap with you, you can loosely wrap it around your dog’s entire torso. If your dog has a foreign object coming out of his or her body, don’t try to remove it. Leave the object where it is and get to medical attention as soon as you can. If you’re hiking near Castle Rock, Colorado, call us at 303-688-3757. If your dog needs timely attention and we don’t have the capacity to take care of your dog in the way he or she deserves, we’ll refer you to an emergency vet clinic. We want to ensure your pup can be treated right away! For emergency care after hours, on Sundays, or on holidays, please contact: Animal Emergency & Specialty Center.